Whether we’re talking about a family heirloom dining table or just your favorite old deck chair, sometimes we don’t want to throw away worn out old wooden furniture. Thankfully, it’s usually possible to restore these old pieces to reusable condition. Here at Top Of The Line Contracting, we specialize in refinishing old wooden furniture and getting it back to a state where you can be proud to display it in your home. How do you refinish furniture? We do anything necessary to get your furniture back in top condition. We can strip paint, replace damaged sections, repair chips or cracks, change the finish, or paint the furniture to make it more presentable. The first step is usually to strip away the old finish from the furniture. This is usually done through a combination of sanding and chemical strippers. These strippers should be used only in a well-ventilated area and with the proper safety precautions, such as rubber gloves and eye protection. Once the old stain is removed and the furniture is sanded down to bare wood, we can get started on any repairs. After necessary repairs are completed, we then evenly sand the entire surface and apply a sealer, which helps prevent the furniture from absorbing the stain unevenly. Finally, depending on the project, we will choose an appropriate stain and finisher, restoring your furniture to its original state so it can make a beautiful addition to your home for years to come. What type of furniture can be refinished? Basically anything: Tables, chairs, desks, dressers, bed frames, and any other wooden furniture. The only concern is that the furniture in question is made of solid wood instead of plywood or particle board. These materials cannot be sanded down, and attempting to refinish them will just ruin them. 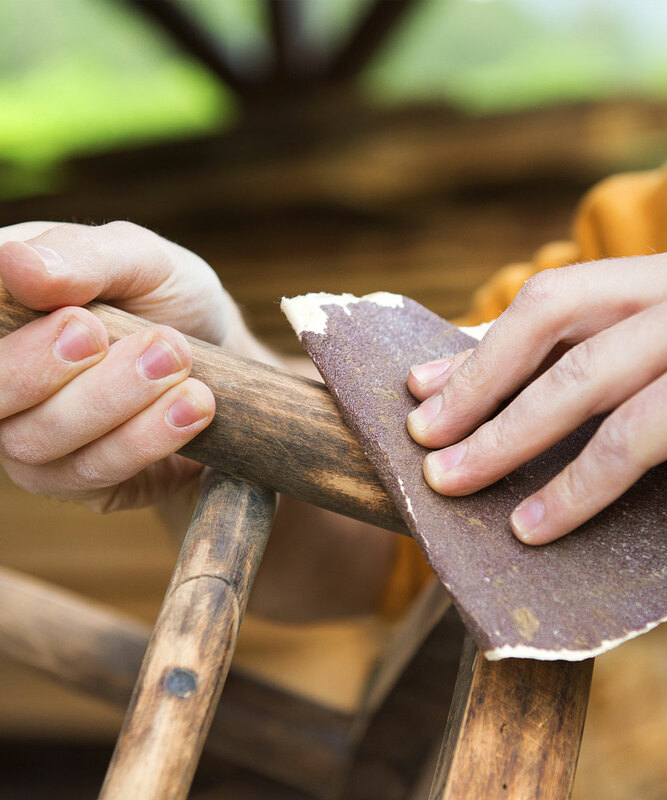 Make sure your furniture is solid wood before attempting any refinishing jobs.